The 2017 European PeP Meeting: 16th edition of the European Meeting of People experiencing Poverty #2017PEP. Don’t hesitate to subscribe to this blog to be kept informed of any news in real time and to follow us on Facebook EAPN – European Anti-Poverty Network and Twitter @EAPNEurope! The whole meeting is open to press. A press badge will be given at the registration desk and a press point will be available on the premises. If you wish to make interviews with speakers and Delegates from all national delegations, contact here below Elke Vandermeerschen, EAPN’s communications officer. The 2017 European Meeting of People Experiencing Poverty is organized at the MCE in Brussels by the European Anti-Poverty Network (EAPN) with the support of the European Commission, the Estonian Presidency of the Council of the European Union and the EAPN Fund. For press and media issues at national level, see here the list of National Coordinators with their contact details on this page. In 2010, the EU adopted the Europe 2020 Strategy, aimed at guiding the EU towards a smart sustainable and inclusive economy. Among the five headline targets of this strategy, a poverty target was adopted for the first time, to reduce by at least 20 million the number of people ‘At Risk of Poverty or Social Exclusion’ (AROPE). 3. Living in a household with very low work intensity(The work intensity of a household is the ratio of the total number of months that all working-age (18-59 years) household members have worked during the income reference year and the total number of months the same household members theoretically could have worked in the same period). The most recent data available (2013) show that 24,5% of the EU population, that is 122,6 million people, are at risk of poverty or social exclusion. 16,7% of the population in the EU is at risk of relative income poverty, 9,6% is severely materially deprived, and 10,7% is living in households with very low work intensity. Overall at the EU level, single-person households with dependent childrenare the mostseverely materially-deprived (20,1%) followed by single-male households (12,5%) and households with two adults and three or more dependent children (11,4%). Very low work intensity is most common in single-person households (23,4%) and single-person households with dependent children (28,8%). In 2013, 46,6 %of people who were unemployed were at risk of poverty. 8,9% of the people in employment were living under the poverty threshold. Each European Meeting of People experiencing Poverty issued a report of the meeting, including the Meeting’s key messages. Many, particularly the latest ones, included creative and visual presentations (videos, slogans, symbolic creations). All the reports and creative presentations are available under The Previous Meetings page on this website. 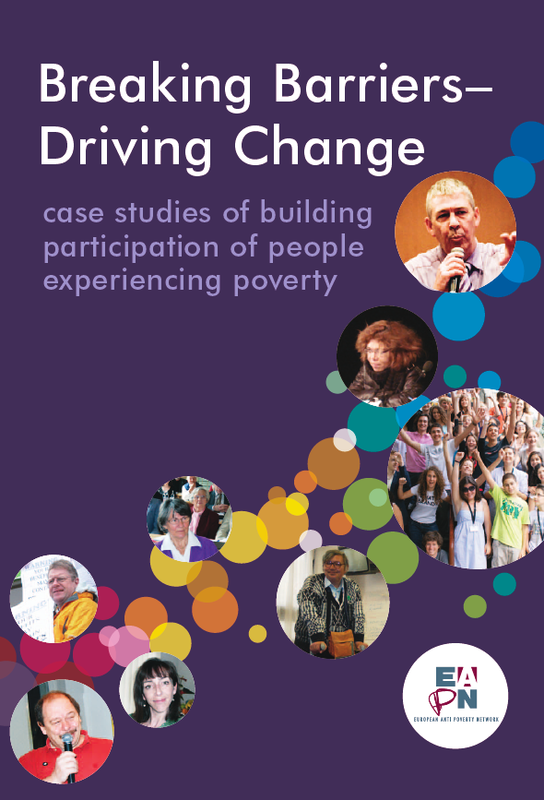 Breaking Barriers – Driving Change – Case studies of building participation of people experiencing poverty is the second publication by the European Anti-Poverty Network (EAPN) highlighting members’ initiatives to strengthen the direct participation of people experiencing poverty in organisations and in policy-making. Small Steps – Big Changes – Building participation of people experiencing poverty presents 10 case studies from members of EAPN about the participation of people experiencing poverty and social exclusion and hereby shows that successful participation is possible. The publication is available in English, French and Greek. EAPN has also issued a series of EXPLAINERS tackling key issues and debates, which are also priorities within the EU poverty discourse, in understandable, everyday language. They are aimed primarily at people working in civil-society organisations, but also at anybody who is concerned with how to make progress on reducing poverty and social exclusion in the EU. Towards Children’s Well-being in Europe –Explainer on Child Poverty in the EU (2013), jointly with Eurochild. All EAPN books are available here on EAPN website.